Among the beauty around Manaslu Circuit Trekking, the diversity of topography stands out. The Manaslu Circuit Trekking trail in this region passes rural farmland up to alpine lakes and glaciers. High altitude trek to Larke Pass (5160 mt.). Magnificent view of the Himalayas including Siringi Himal, the Pangboche Peak, Mt Himalchuli and Mt Manaslu (8,163 mt.). Manaslu Circuit Trekking is one of Nepal’s most exciting trekking routes. The popularity of the route has been growing exponentially over the last few years primarily as an alternative to the neighboring Annapurna Circuit. The showpiece mountain of this Manaslu Circuit Trek is the twin-peaked Manaslu (8156 m, 26,758 ft). Manaslu stands out as the eighth highest peak on the planet. Along the route to the Himalayan highlands are lush jungles and scenic villages surrounded by terraced fields. Eventually, the trail rises to a barren alpine landscape surrounded by snowy mountains soaring into the skies. The feeling is otherworldly in this remote terrain. The Manaslu Circuit Trekking requires extra paperwork to visit and thus far it has seen far fewer visitors than its famous neighbor, the adjoining Annapurna Region. This Manaslu Circuit Trek is a chance to visit before the trails get crowded! Among the beauty along this route, the diversity of topography stands out. The Manaslu Circuit Trekking trail passes rural farmland up to alpine lakes and glaciers with mountain views. The trail passes through spectacular highland villages before eventually rising to the high mountain pass known as Larkya-La (5160 mt, 17,200ft), the highest elevation of the circuit. To the north of the Manaslu area is the border of Tibet and the Manaslu Circuit Trek route has been part of a trade route for centuries. The Manaslu Circuit is ideal for trekkers looking for an adventure similar to the Annapurna Circuit but with less of the crowds. There is a lot to explore along the Manaslu Circuit Trekking including hot springs and magnificent monasteries. It is ideal for trekkers looking for a thrilling adventure in a relatively unexplored area of the Himalaya with much of the same benefits of natural beauty, biodiversity and cultural richness as the more popular areas but with fewer of the crowds. There is a lot to explore in the area and Manaslu Circuit Trek can be easily combined with the remote Tsum Valley Trek, the adventurous Ganesh Himal Trek and the Ruby Valley Trek as well as the classic Annapurna Circuit and more including Nar and Phu villages and beyond. Please let us know if you have the time and interest and would like to extend your journey to this region and beyond. We look forward to guiding you to all of its highlights. Please Note: Our Manaslu Circuit Trekking has set departure dates from both Pokhara and Kathmandu and this trek can be personalized to accommodate your specific wishes and timetable. We can arrange a trek that combines with the remote Tsum Valley Trek for people with the time and interest. Day 02Trip preparation day (Sightseeing optional). Overnight at hotel. Day 04Sotikhola to Machhakhola (570 mt.). Walking 5-6 hours. Overnight at guest house. Day 05Machhakhola to Jagat (1370 mt.). Walking 5-6 hours. Overnight at guest house. Day 06Jagat to Deng (1920 mt.). Walking 6-7 hours. Overnight at guest house. Day 07Deng to Namrung (2250 mt.). Walking 6-7 hours. Overnight at guest house. Day 08Namrung to Sama Gaun (3450 mt.). Walking 6 hours. Overnight at guest house. Day 09Rest day for acclimatization and exploration at Sama Gaun. Overnight at guest house. Day 10Sama Gaun to Samdo (3780 mt.). Walking 3-4 hours. Overnight at guest house. Day 11Samdo to Dharmasala (4460 mt.). Walking 3-4 hours. Overnight at guest house. Day 12Dharmasala to Bimtang (3630 mt.) via Larkya-La pass (5135 mt.). Walking 7-8 hours. Overnight at guest house. Day 13Bimtang to Tilje (2240 mt.). Walking 5-6 hours. Overnight at guest house. Day 14Tilje to Dharapani (1430 mt.) and drive to Besisahar. Walking 2-3 hours and driving 4-5 hours. Overnight at guest house. Day 15Drive back to Kathmandu by bus. Driving 5-6 hours. Overnight at hotel. Personal Expenses including laundry, telephone calls, bar bills, drinks, and snacks. Expenses incurred by cancellation and events beyond our control, for example, weather delays, trail detours, political unrest, illness, and et cetera. Day 2Trip preparation day (Sightseeing optional). Overnight at hotel.A day to proceed and obtain special trekking permit from the Immigration office in Kathmandu. All kind of preparation and sightseeing in UNESCOs' World Heritage sites are the other options of the day. Day 3Drive from Kathmandu to Arughat (570 mt.) and further drive to Sotikhola. Driving 8-9 hours. Overnight at guest house.Our destination today is Sotikhola. We start early on a local bus, which stops for breakfast and lunch on the way and brings us to Sotikhola in about nine hours. Situated on a location with Budi Gandaki River nearby, the bazaar provides accommodation facilities for anyone traversing the land. This is our trailhead for this trip and this is where we stop for the night. Day 4Sotikhola to Machhakhola (570 mt.). Walking 5-6 hours. Overnight at guest house.Our stopover for lunch today is Lapubeshi. We therefore head off in this direction for roughly three hours by most people’s watch. A village populated by the Gurungs, Lapubeshi is big with almost a hundred constructions. It is here we stop for lunch. Dal-Bhat is a filling option for many. Dal-Bhat does not just come with the Dal (a thick lentil soup) and Bhat (rice); it comes with at least vegetables and pickles and one can ask for some more helpings for no extra charge. After all, ‘Dal-Bhat-Power, 24-Hour’ is how the common saying goes. While having lunch, the view on display of the Ganesh Himal Range as well as Mt Siringi is captivating. Lunch over and we move on. Just as we cross a suspension bridge as we near Machhakhola, the waterfall attracts the attention of everyone traversing the land. Machhakhola, a clustered settlement, is where we stop for the night. Day 5Machhakhola to Jagat (1370 mt.). Walking 5-6 hours. Overnight at guest house.On our way to Jagat, Tatopani is where we stop for lunch today. We therefore head of in this direction on a walk that often lasts for around three and a half hours for most. The initial couple of hours takes us all through forest thick and thin on a path that is a gentle uphill. Home to a number of animal species, the forest does present an opportunity of an encounter with one or the other. With no motorable roads in sight, we finally arrive in Tatopani, where lunch awaits our arrival.On a trail that does not differ much from the one just travelled, we trudge on after lunch. The next couple of hours or so should bring to Dovan. This village with only a few places for accommodation for travelers also come with a primary school. Once we arrive in Jagat, we check-in for the night in this large settlement, which also happens to be the check point for permits. Day 6Jagat to Deng (1920 mt.). Walking 6-7 hours. Overnight at guest house.We start out on a levelled ground for those first sixty minutes today to Salleri. A steady ascent followed soon by a steep one takes us all to Philim. This is where we stop for lunch today. Philim is a settlement with some facilities for the local for whom the place is a home. A high school, a helipad and some clinics at their disposal, the people living in the area are certainly luckier than their counterpart living in many other similar viillages. Lunch over and we move on. We start out by choosing to travel the route that turns left, leaving the one to the right which leads to Tsum Valley. This three-hour or so journey to Pewa.is lenient on the legs, presenting an almost flat trail to walk on. We stop by a riverside service provider for lunch. Lunch over and we move on. Our destination now is Dang, where we stop for the night. Dang comes with some basic accommodation facilities and seems to present a Tibetan feel. Day 7Deng to Namrung (2250 mt.). Walking 6-7 hours. Overnight at guest house.This overall five to six hours travel today starts out with a three hour walk to Lho. Although open in comparison, the course offers an ascent that certainly falls on the sharper side. Lho is the village where we stop for lunch. Lunch over and we move on to Namrung, walking those next three hours or so on a route that is steep and therefore demanding. Namrung, where we stop for the night, is also the check point for permits. One may find those yaks and mules on hire for transportation purposes something from the times fore gone. Day 8Namrung to Sama Gaun (3450 mt.). Walking 6 hours. Overnight at guest house.Lho is where we stop for lunch today. We therefore head off in this direction. Walking this route is an experience of its own. We start out with the Ganesh Himal to our back. Mt Huinchuli is the next to join in. Once the landscape sees some cultivation, it is time to understand that Lhi is now pretty close. In the presence of Mt Manaslu, Himalchuli and Siringi Himal among others in view, a lunch in Lhi is worthwhile. Lunch over and we move on. The route presents a sharp two-hour uphill to traverse on and comes to Shyala. The next hour which the legs find comforting leads to Sama Gaon. This big village houses a number of monasteries. With that access to roads, the village relies on fellow mammals, the mules and the yaks, for transporting necessary goods. Day 9Rest day for acclimatization and exploration at Sama Gaun. Overnight at guest house.The day today is for acclimatization. Once in higher altitudes, it is important that we allow the body the opportunity to adapt since the amount of oxygen in the air now becomes less and less. This process requires us to walk higher up but come down for the night.For this purpose, many choose to venture out to Birendra Lake. 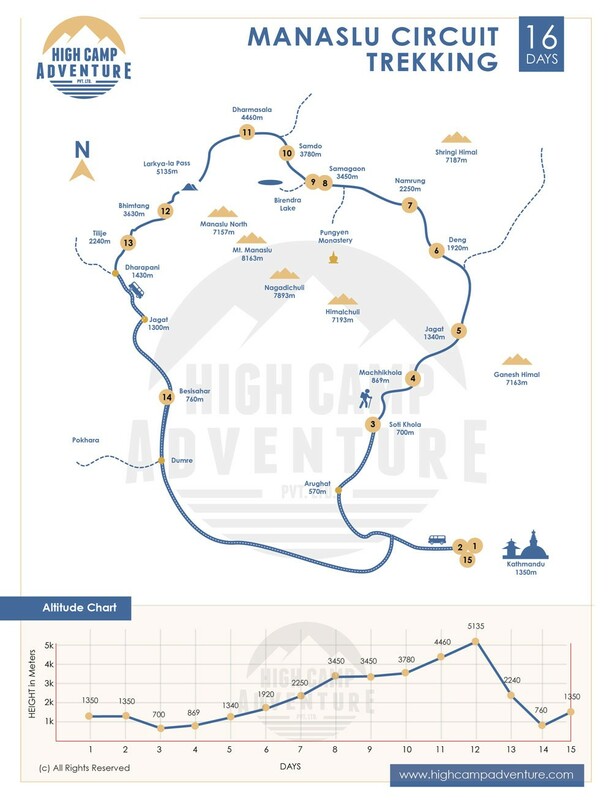 Some even try the ascent to Manaslu Base Camp at 5,400 metres. Day 10Sama Gaun to Samdo (3780 mt.). Walking 3-4 hours. Overnight at guest house.Our destination today is Samdo, all the way. We therefore head off in this direction. With no humans residing in this part of the trek, we traverse the land up a sharp ascent just after that initial twenty odd minutes. As Pangbuche Peak closes in, we arrive in Samdo, a large settlement, where we stop for the night. Potatoes are popular here as this seems to be the major produce. Some still have that energy to go up further to the hilltop, a vantage point for some more of those spectacular, the ones that never cease to awe-inspire. Day 11Samdo to Dharmasala (4460 mt.). Walking 3-4 hours. Overnight at guest house.We start out after breakfast on our way to Dharmashala. This almost four hours of walk requires everyone to traverse through a landscape bare and towards those rocky structures, many of which are festooned with ice and snow. A good idea is to walk slow as the altitude signals the thinning of the air. The accommodation here fits in around three dozen or so comfortable. The rest will have to make do with the large tents that seem to house more than a hundred at a go. Dharmashala is where we stop for the night. Day 12Dharmasala to Bimtang (3630 mt.) via Larkya-La pass (5135 mt.). Walking 7-8 hours. Overnight at guest house.Crossing a pass at an altitude of around 5,350 metres demands that we start pretty early. We do so at around five in the morning. A hot bowl of soup is a good idea to start with. We reach the Larke Pass in approximately four and a half hours. We enter Manang District when we cross the pass. The path now is a steady downhill. In the presence of the Larke Peak, Pongkir Peak as well as a glimpse of Annapurna I, we walk further to Bimtang, where we stop for the night. With around five dozen accommodation facilities to choose from, we check-in one of them. The view from here too is just breathtaking. The only difference is that it’s the East Manaslu Range, Naike Peak and Himalchuli look spectacular this time around. Day 13Bimtang to Tilje (2240 mt.). Walking 5-6 hours. Overnight at guest house.Surki is our stopover for lunch today. We therefore head off in this direction. On narrow paths mostly, we reach Surki, a small settlement, in about four hours. This is where we stop for lunch in one of those five or six service providers. It takes a couple of more hours for us to reach Tilje from here on. Although Tilje is an emerging settlement, it already offer us with around five dozen places to choose from for our accommodation. Day 14Tilje to Dharapani (1430 mt.) and drive to Besisahar. Walking 2-3 hours and driving 4-5 hours. Overnight at guest house.Today, we start out on a descent that is not demanding. We stop at Dharapani on the way for lunch. Lunch over and we continue. Crossing into Annapurna Conservation area requires us to produce one more permit. Beshisahar is where we stop for the night. Day 15Drive back to Kathmandu by bus. Driving 5-6 hours. Overnight at hotel.Our return to Kathmandu is on a tourist bus, a ride that should last for around six-hours. With breakfast and lunch on the highway, the bus stops in Sorhakhutté in Kathmanddu. Thamel, the tourist hub, is a stone’s throw from here. Day 16Transfer to airport for your final departure from Nepal.Depending largely on your travel fixture, you will be leaving for Tribhuwan International Airport for your departure from Nepal either in the morning or in the afternoon or in the evening. Departure Note : Please take a look at our fixed departure dates for Manaslu Circuit Trek. If they do not fit with your schedule, then please let us arrange an itinerary that ismore suitable to you and your requirements. Manaslu Circuit Trek is a strenuous trek which is fit for those who has the ability to walk 5-6 hours of walking uphill and downhill in a day carrying a personal day pack. Some days are longer with 7- 8 hours of walking as well. Manaslu Circuit Trek is high altitude trek which demands more physical, however having strong determination, positive vibe and average physical fitness can complete this trek. Some time mental aspect also plays a vital roll in an altitude. Doing some physical exercise a few weeks prior to the trip is better but technical skill is not required for this trek. If you are taking medicine for heart, lung or blood diseases, please kindly consult your doctor and inform to High Camp Adventure. Spring (March to May) and Autumn (September to November) are the best months for Manaslu Circuit Trek. Where normally days are sunny, the temperature is perfect, the sky is clear and Mountain remains crystal. This trek can be done in Monsoon (June to August ) but you should not expect the great weather and Mountain view. You can do it in Winter (December to February) if you are used to with extreme cold temperature.